Commercial Real Estate has had an incredible run since its financial crisis lows in 2009. This sector outpaced the broader residential S&P Case-Shiller Index and has reached levels that have surpassed the pre-crisis highs. Commercial real estate (CRE) includes office buildings, hotels, resorts and shopping malls or retail outlets. The category which has had the best performance of this sector, however, has been senior living homes. The increase in valuations for CRE has been exponential over the last 3 years in particular. Investors have been attracted by the higher yields of CRE in an environment that has seen interest rates diminish across the board. 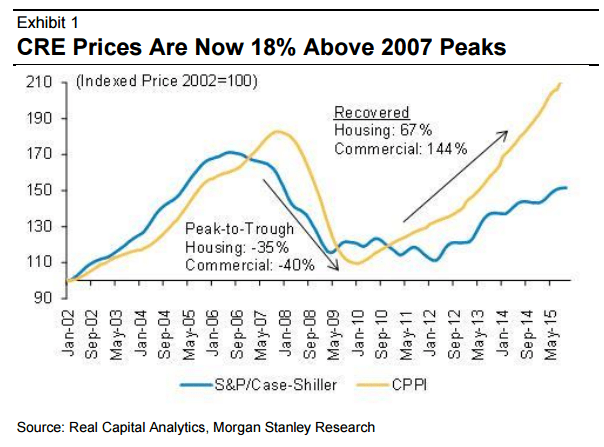 Analysts at Morgan Stanley see price growth in 2016 for CRE a mere zero percent, which replaces a previous forecast of 5%. This comes amidst reductions in Loan- to-Value levels. Higher levels of leverage give investors higher returns. But the market has seen a reduction in Loan-to-Value levels from an average of 70% to 60%. This reduction in leverage means that that CRE has to create larger operating profits to compensate. The required increase needed to offset a 10% decrease in leverage is 2.25%. Such an increase might prove difficult in the current economic environment unless the economy begins to pick up again. So it may not come as a surprise that CMBS prices are starting to fall. Since the beginning of the year, risk premiums for these bonds have jumped 275 basis points. This increase equals a near 18% drop in prices for bonds with a triple-B rating. CMBS are the backbone of financing for commercial real estate, and a drop in prices will mean that financing will be harder and more expensive. This will reduce the Net Operating Income and diminish net property valuations. This sector does not have a large exposure to oil or energy companies, which is the sector that has been worse hit in the stock market. This is causing some analysts to question the reasoning behind the recent sharp drop in prices. The recent rise in interest rates and concern about future interest rate increases could be what is holding back CMBS buyers from investing at previously lower rates. Higher interest rates mean that the value of income flows from CRE are reduced, as most CMBS loans range from 5 to 10 years, to get committed now at a fixed interest rate could be extremely disadvantageous if interest rates rise over the next year or two. Some big players have been sellers of these bonds, the Wall Street Journal names George Soros’ family office and PTG Pactual a Brazilian investment bank, as having liquidated their holdings in this type of asset. Yields for CMBS with a triple-B rating are nearly 8% above benchmark rates, a level not seen for four years. That kind of yield is what you would most likely expect to achieve when investing in corporate junk bonds. Players may be divesting this type of investment due to the recent market turmoil and a reduction in risk appetite. There could also be the fact that we may be entering a higher interest rate environment. As these bonds have an average maturity between 5 to 10 years, investors do not want to commit capital at previous yields when interest rates could be on the rise over the next year or two. A recent Trepp report shows that the delinquency rates in CRE have dropped for a second consecutive month. The current delinquency rate is at 4.15% which is a drop of 20 basis points compared to January, and 143 basis points lower than one year ago. Another factor showing the relative health of CRE is the amount of CMBS issues, which continues to be on the rise. 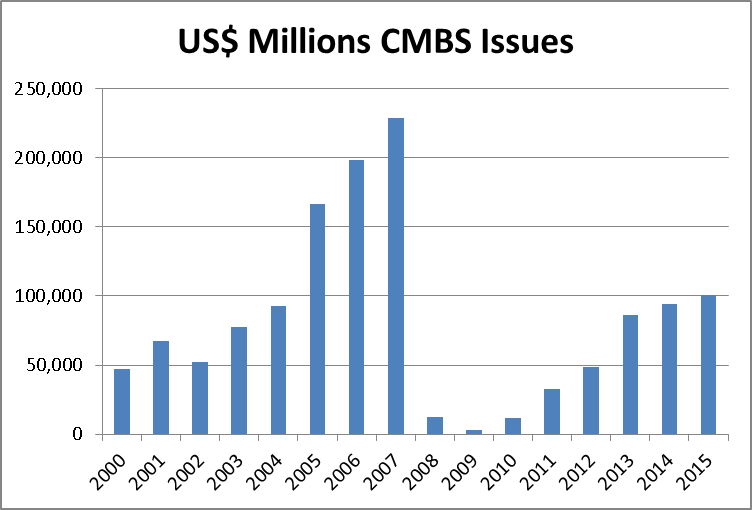 2015 saw CMBS issuance rise to $101 billion, which is still a long distance from the amount issued in 2007 before the subprime crisis. However, issuance has more than doubled in since 2012 when $48.4 billion were issued. Further increases in the size of the CMBS market may be limited if interest rates continue to increase rapidly offering more attractive returns on simpler assets. This type of bond is considered more sophisticated and usually carries a premium for the complexity of its structure. If corporate bond yields begin to rise, then CMBS issues may decline as investors prefer the simpler asset at higher yields. To counteract losing investors, CMBS issues will probably have to generate higher returns to attract and maintain investor interest. However, a higher interest rate scenario may not necessarily have an adverse impact on investments in CRE equity. Renewed leases which are usually indexed to inflation or similar indices should create the extra income necessary to compensate for higher interest rates.